Artisphere presented by TD Bank reported another record-breaking year. This was the 13th annual show for Artisphere in Greenville, which continuously ranks among the best in the country. Visitors loved seeing the talented artists who are right here in town or as far away as the Czech Republic. Friendly artists created a welcoming and educational atmosphere throughout the festival. The artists became like storytellers, sharing their processes and inspirations to future artists. The economic impact from the weekend reached a record $6,652,682 (a 4% increase over 2016). Artisphere also reached its highest attendance of 99,817 at the festival. Widespread cabin fever from the rain Friday brought energetic crowds Saturday and Sunday. Crowds of all ages enjoyed the live street art, and the buying energy was high from art connoisseurs of all backgrounds. Artists’ sales increased, on average, by 11% from $8,200 to $9,150. Total artists’ sales for the festival weekend are estimated at $1,228,500 (a 10% increase over 2016, based on artists’ input). making, and metal working. These local artists loved being able to share their art with the public and advertise locally at the same time. Local artists help make people aware of the art that is around them, even after the festival is over. Artisphere also contributed $20,000 to its volunteer groups. These volunteers could be found serving artists and visitors alike. 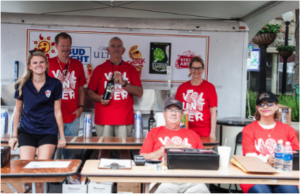 The volunteers who helped with the festival include Boy Scout Troop 266, Greenville Chinese Cultural Association, Greenville Chorale, Greenville Concert Band, Hispanic-American Womens’ Association, International Ballet, Palmetto Statesmen, South Carolina Children’s Theatre, and Vocal Matrix. The Culinary Arts Café was the perfect spot for friends to get together and catch up over a bite to eat and live music. Families also enjoyed a place that allowed everyone to eat what they wanted. It served cuisine from 7 local restaurants and the Greenville County Career Center’s Culinary Arts Program, whose student chefs won Best in Show. Instead of choosing a type of fare to serve, the students created dishes that all involved one particular food, corn. Three different music stages featured 13 local musical acts and 14 local theater and dance group performances. These stages brought awareness of talent that locals might not be aware of. Getting to see the South Carolina Children’s Theatre gave the actors a chance to perform in front of a receptive, live audience. Students also learned what they can be a part of in the community by seeing different theatre and dance groups perform. Kids and adults alike enjoyed the 12 local artist demonstrations in the Furman Art Lab. There was also a record breaking year for the 10th annual Artists of the Upstate Exhibit. With 188 applications, 68 pieces by local artists were featured in the exhibition, and 183 student artists participated in the Current Tools Greenville County High School juried exhibition. 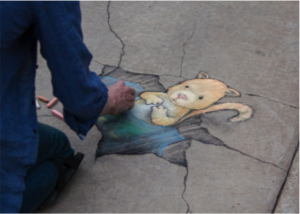 Artisphere was proud to host Ann Arbor, MI street artist and illustrator David Zinn. 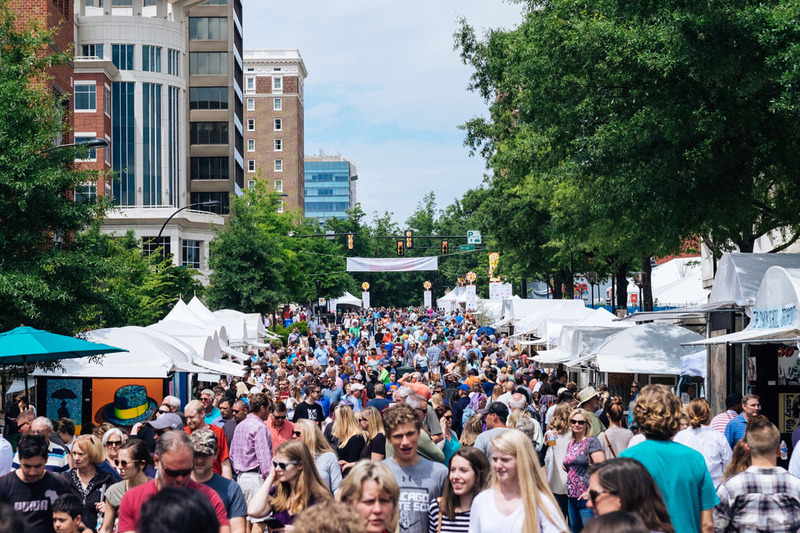 Zinn’s take on Greenville’s beloved “Mice on Main” entertained and delighted festival-goers as they began a search to find all 5 mice or to catch Zinn in action. Also new to the festival was local artist Matt Gutierrez who created directional chalk signage along the festival site. The festival also sparked an interest in art by having Kidsphere, a tent where children could learn different techniques and how art is used in everyday life. Artisphere is not only focused on showcasing current artists, but also on creating artists of the future. By showing a variety of art forms, the festival is creating artists and art collectors of all ages. By showcasing art in all its forms, Artisphere has bettered the community of Greenville artistically, economically, and socially. It provides a weekend of beauty to awaken summer spirits and bring life into the community. Plans for the 2018 festival are underway and the dates are set for May 11-13. Visual artist applications can be submitted on www.zapplication.org July 28 through October 6, 2017.